Learn how to find downloaded files in your computer. Many people find it a bit tricky to locate files that they had recently downloaded using a browser. You come across a useful file on the Internet and you decide to download it. But when download completes, you don’t know where the downloaded file has gone! For most computer users, this may be a routine and very easy task, but many people find it a bit difficult to locate downloaded files in their computer. Today, TechWelkin will focus on this issue and will answer this amusing query. Mostly people download files using web browsers like Google Chrome, Mozilla Firefox and Internet Explorer. We will tell you how to locate recent files downloaded using browsers. Windows computers have a default location where downloaded files are usually stored. By default, web browsers download files in the Windows Download folder. Therefore, after download has finished, you should open Windows Explorer or File Explorer in your computer to find the files. Google Chrome shows downloaded files in a bottom docked bar. You should click the tiny arrow shown on the right hand side of each downloaded file and select Show in folder option. 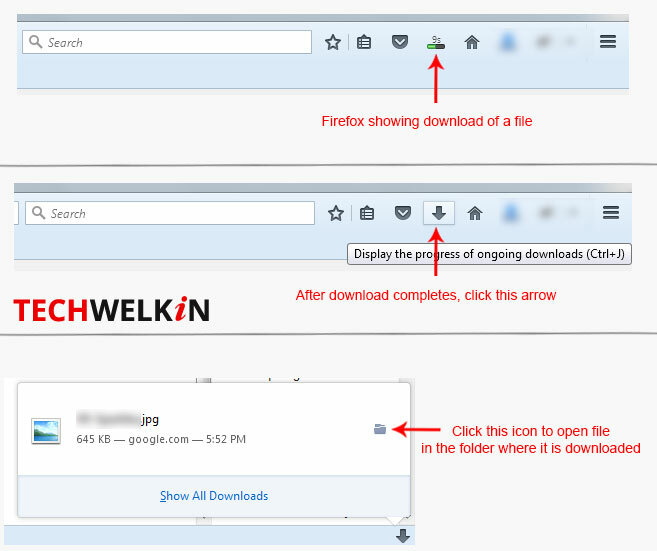 Mozilla Firefox also allows you to locate recently downloaded files. Follow the instructions given in the following image and you will be able to open and locate the file right in the folder where is has been downloaded. 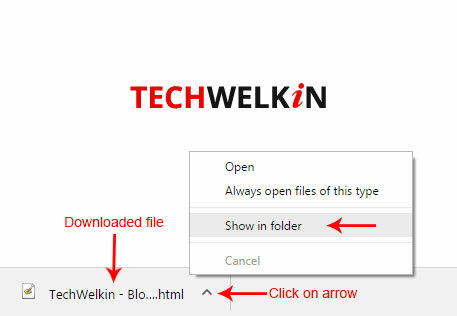 We hope that these tips will be useful for you and that now you will easily locate your recently downloaded files in a folder. Should you have any questions, please feel free to ask in the comments section. We will try and assist you. Thank you for using TechWelkin!